I like aubergines a lot, but I must confess that aside from throwing them diced up in a veggie curry I hardly cook with them at home. 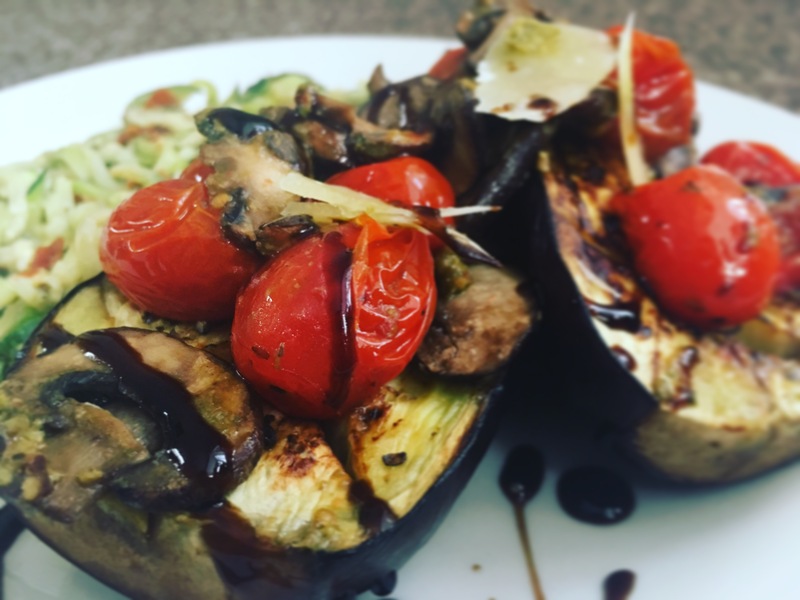 When I was doing the food shopping last week I decided on a whim to add a couple of aubergines to my basket, although I wasn’t exactly sure what I planned to do with them, but an idea came to me yesterday and I have to say it worked out rather well. I was inspired by a recent visit to Malmaison for Sunday brunch. The second course of meats, cheeses and salads reminded me how much I enjoy chargrilled vegetables, and I couldn’t get enough of the fresh tomato salad with hints of basil and olive oil. 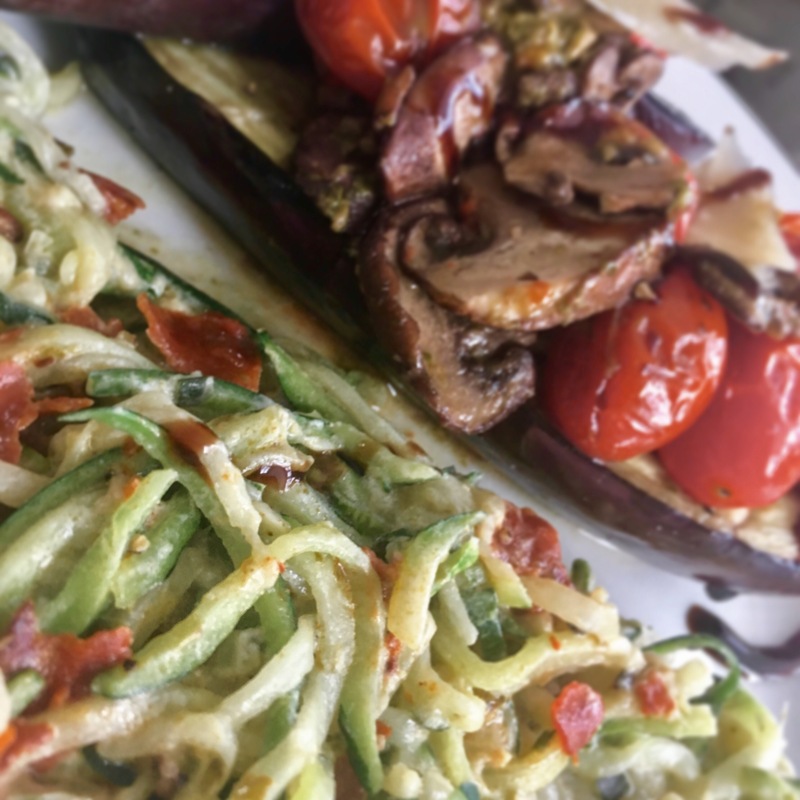 Taking these inspirations, and after raiding my fridge for other ingredients, I created this baked aubergine dish which combines roasted chestnut mushrooms and plum tomatoes with pesto and chorizo courgetti. 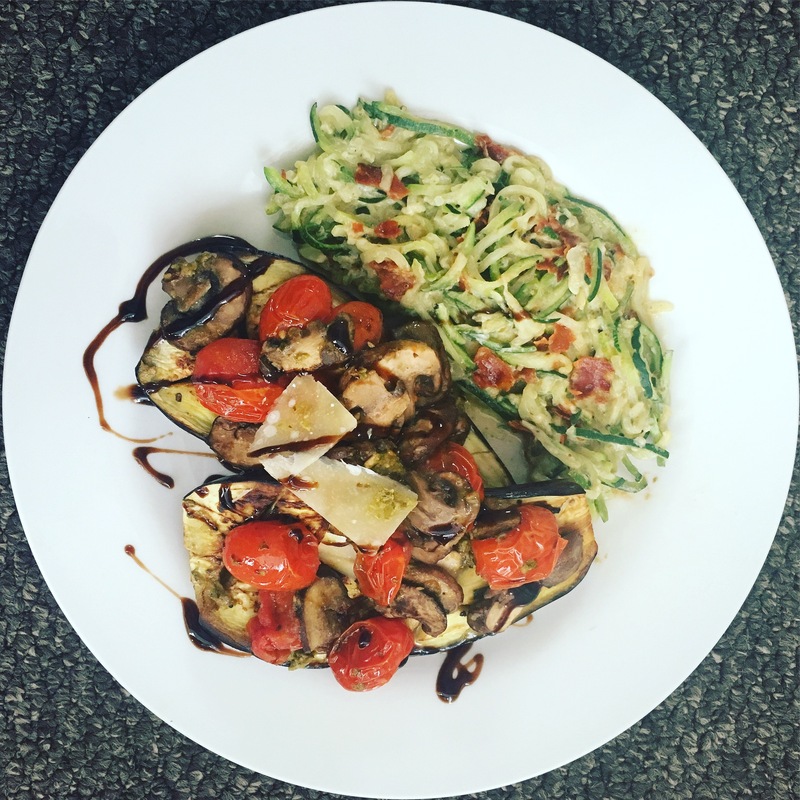 Turns out I still don’t really know how long to cook an aubergine, but thankfully my Twitter friend and fellow food blogger Andy *check out his fab veggie blog here* gave me a tip regarding frying it a little first and I have to say it turned out really well. I added a teaspoon of reduced fat sour cream to make the courgetti creamy and and crumbled in some chorizo crisps (yes, that’s a real thing) from M&S I had in the fridge. So what do you think? Fancy it? Let me know in the comments. Half the aubergine and crisscross the flesh with a knife before rubbing in salt and olive oil. Place fleshside down in a pan and fry gently for 5 minutes. Add the semi cooked aubergine to a roasting tray along with the mushrooms and tomatoes. Drizzle olive oil and seasoning over everything and pop in a 190c oven for 10 minutes. In a pan fry the courgetti for 1 minute before adding the pesto and sourcream. Add a dash of milk to loosen if needed. Cook for another minute then season and sprinkle in the chorizo to warm through. Plate up the courgetti and aubergines before topping with the tomatoes and mushrooms. Drizzle with olive oil, balsamic glaze and a few shavings of parmesan if you like it.